For more details on the academy squads, see Liverpool F.C. Reserves and Academy § Academy squads. ↑ Doubles won in conjunction with the treble, such as a FA Cup and League Cup double in 2001, are not included in the Doubles section. ↑ Liverpool. 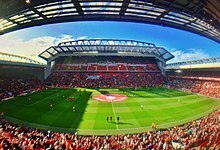 "New Anfield capacity confirmed as 54,074". Retrieved 9 September 2016. ↑ Eaton, Paul (13 May 2002). "We speak to YOUR Player of the Season". Liverpool F.C. Archived from the original on 12 June 2015. Retrieved 4 June 2015. ↑ Eaton, Paul (7 May 2003). "Murphy named Reds Player of the Season". Liverpool F.C. Archived from the original on 14 July 2015. Retrieved 4 June 2015. 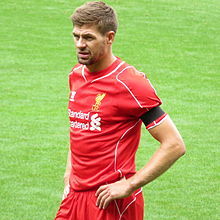 ↑ "Gerrard delighted with Player of the Year vote". Liverpool F.C. 21 May 2004. Archived from the original on 12 June 2015. Retrieved 4 June 2015. ↑ Hunter, Steve (4 May 2005). "Carra wins .tv player of the season". Liverpool F.C. Archived from the original on 14 July 2015. Retrieved 4 June 2015. ↑ Rogers, Paul (23 May 2006). "It's Official: LFC Player of the Season". 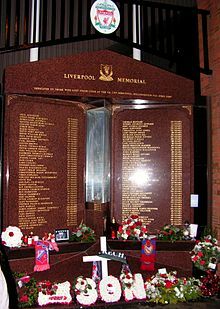 Liverpool F.C. Archived from the original on 12 June 2015. Retrieved 4 June 2015. ↑ "Gerrard voted fans' player of the season". Liverpool F.C. 26 May 2007. Archived from the original on 12 June 2015. Retrieved 4 June 2015. ↑ Eaton, Paul (19 May 2008). "Vote result: LFC Player of the Season". Liverpool F.C. Archived from the original on 12 June 2015. Retrieved 4 June 2015. ↑ Carroll, James (4 June 2009). "LFC Player of the Season: Steven Gerrard". 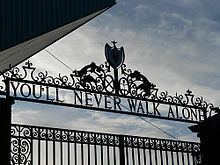 Liverpool F.C. Archived from the original on 12 June 2015. Retrieved 4 June 2015. ↑ Rice, Jimmy (11 May 2010). "Reina crowned Player of 09–10". Liverpool F.C. Archived from the original on 23 April 2014. Retrieved 4 June 2015. ↑ Carroll, James (24 May 2011). "Lucas scoops 2010–11 award". Liverpool F.C. Archived from the original on 24 November 2012. Retrieved 4 June 2015. ↑ Carroll, James (14 May 2012). "Skrtel named LFC Player of Season". Liverpool F.C. Archived from the original on 15 April 2014. Retrieved 4 June 2015. ↑ Shaw, Chris (28 May 2013). "Your player of the season revealed". 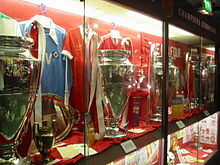 Liverpool F.C. Archived from the original on 5 June 2013. Retrieved 4 June 2015. ↑ Carroll, James (27 May 2014). "Suarez wins another season award". Liverpool F.C. Retrieved 4 June 2015. ↑ Shaw, Chris (19 May 2015). "Phil wins four prizes at Players' Awards". 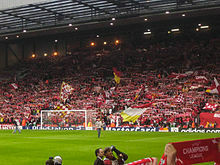 Liverpool F.C. Retrieved 4 June 2015. ↑ "Quartet of accolades for Philippe Coutinho at LFC Players' Awards". Liverpool FC. Retrieved 12 May 2016. ↑ Shaw, Chris (9 May 2017). "Sadio Mane takes top prizes at LFC Players' Awards". Liverpool FC. Retrieved 10 May 2016.